Bout of Books is underway, and I’m really glad to be getting out of my reading slump and actually finding some books that I’m excited to read. So far, I’ve only finished one book, but more importantly, I’ve been really enjoying what I’m reading. Life-wise, it hasn’t been a super eventful week so far; I worked long days both Monday and Tuesday but was off on Wednesday, and I used my off day mainly to do some errands, clean, and work out, although I did also finally watch the movie Love, Simon, which was adorable. Despite getting home fairly late, I did get a decent amount of reading done on Monday, but Tuesday was way less impressive. And on Wednesday, I got a bunch of reading done and was able to finish my first book of the readathon! So, remember the very lovely TBR that I made for the readathon? After I figured out what I thought I wanted to read, I immediately lost interest in all of the books in my stack, in a classic mood reader move. So then I needed to figure out something that I was actually in the mood to read. 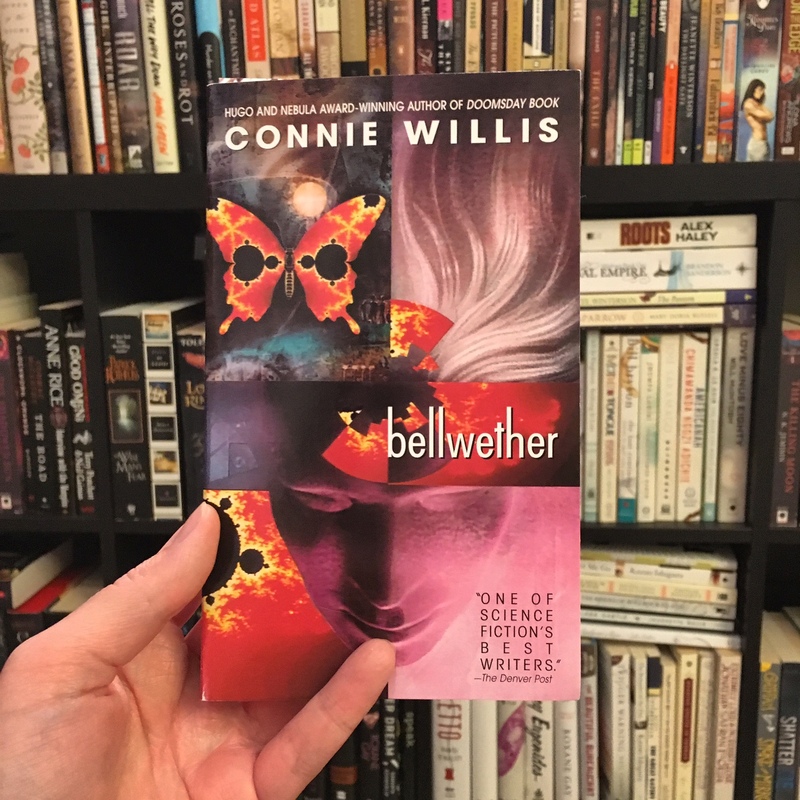 I went with Bellwether by Connie Willis, who has been an author that has busted reading slumps for me before, since her books tend to be funny and chaotic character-driven science fiction. Bellwether is actually set in the early 90’s and follows a sociologist/statistician researching the origins of different fads who works her way towards a scientific breakthrough with the help of a herd of sheep and a chaos theorist. This was the book I finished on Wednesday since it’s short (247 pages) and I ended up really loving it and giving it a solid 4 stars. Also, while browsing my library’s Overdrive app I decided to check out Roomies by Christina Lauren, which is a contemporary romance that I’d heard about on BookTube, and was also recommended to me on Litsy after I read The Hating Game. It’s about a young woman living in New York whose uncle is the composer of the current “it” Broadway musical, and who meets a street musician who would be perfect for a part in the orchestra. Unfortunately, he’s in the country on an expired visa, but she decides that he’s so essential to the production that she marries him to get him a green card. I’m assuming that they then fall in love, since this is a romance, after all. It’s definitely cute so far, and I can see myself picking up more from this author. Weirdly, I haven’t yet started an audiobook, which is usually a key part of readathons for me, nor have I picked up the novella I thought I’d reach for first. It hasn’t been a typical start to a readathon, but since I’ve been reading more than normal and really enjoying the books I chose, I’d say it’s been pretty successful so far. How is Bout of Books going for you? Do you tend to read more or less than expected during readathons? Congratulation on reading your first book 🙂 I read more during a read-a-thon because I give myself an amount of pages to read and aim for. I’ve heard great things about Roomies! Is it good so far?